Cook and stir stew meat in a large saucepan or Dutch oven over medium heat until browned on all sides, 10 to 15 minutes. Drain any excess grease. Stir beef bouillon into beef broth in a bowl until dissolved; pour over stew meat. Add onion, black pepper, and bay leaf; cover and simmer until stew meat is very tender, at least 2 hours. 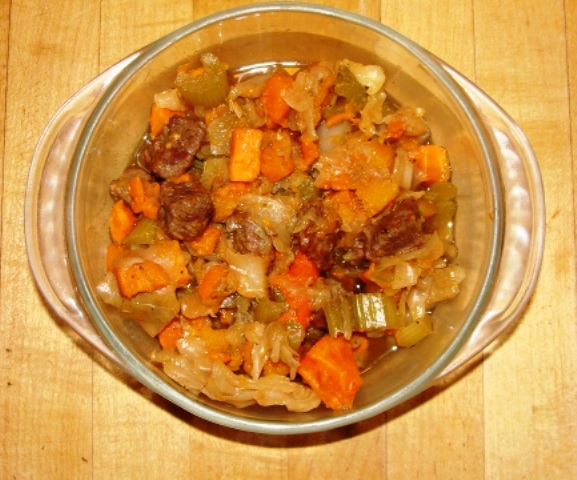 Add potatoes, cabbage, celery, and carrot; cover and simmer until potatoes are tender, 30 to 45 more minutes. Stir tomato sauce and salt into the stew; simmer, uncovered, until tomato sauce is fully incorporated and flavors have blended, 15 to 20 minutes. No comments for: "Beef and Cabbage Stew Recipe"